The downside of having a large family is that it can be difficult to get out and about with your two little ones in tow. The BOB 2016 Revolution FLEX Duallie Stroller fixes this downside by enabling you to do whatever you need to, with ease. It is perfect for a long walk in the park or shopping at your favorite mall. It is lightweight, at 33 pounds, making it easy to put in your trunk and take it where you need to go. It’s also very easy to turn because the front wheel swivels as you need it to. The padded handle bar makes it easy to navigate with a high degree of comfort. You can also easily adjust the height of the handle bar so that it is at a comfortable height for you. While we are talking about being adjustable, the seat operations are really ideal for creating the perfect ride for your little ones. If one of your child falls asleep, you can easily recline the seat with a single hand, so that your baby can continue sleeping peacefully. The ability to lay down one seat, or simply adjust it separately, is a serious attribute to the BOB 2016 Revolution FLEX Duallie Stroller. There is a large basket under the seats that can easily accommodate a diaper bag, extra blankets, or anything else that you would like to keep on hand when you are out. The BOB 2016 Revolution FLEX Duallie Stroller is packed with some very serious user-friendly features. It’s so often that the biggest advantages are the ones that cover simple needs. We all know how strollers bounce. It can be very frustrating when you have a little one sleeping, watching their heads bounce around. 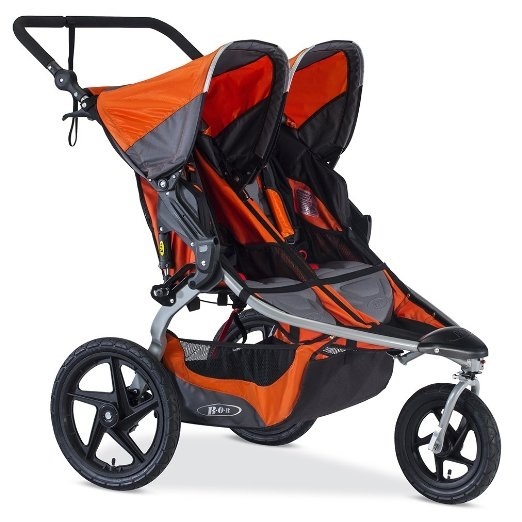 That is where the BOB 2016 Revolution FLEX Duallie Stroller is set apart from other strollers. It has a suspension system that allows it to handle rocky terrain without all the jostling about. The wheels are wide and durable so that they are able to handle multiple types of terrain, giving you the liberty to go wherever you want to go. You will find that the BOB 2016 Revolution FLEX Duallie Stroller has everything you need in a stroller. There is a foot brake that allows you to make a quick stop if you need to. The canopy is going to help make sure that you little one is out of the sun. The cup holders are handy and fit most sized sippy cups. This is a stroller that is made to help families be active and ready to go. You can easily go for a walk, run up and down the soccer field with your other children, and then go to the mall. It can fit into virtually any door way. It is easy to navigate through the aisle of most stores. It is well made, well designed, and a true parent’s helper. Every mom will be glad to see that the BOB 2016 Revolution FLEX Duallie Stroller was designed by listening to moms about what was missing in other models. Considering all its immense benefits, we can safely conclude it is definitely the stroller to get for anyone with more than one child.